Welcome to post number eight of In My Mailbox. In My Mailbox is hosted by The Story Siren to highlight books received for review, won or purchased. Titles link to Goodreads, authors to their website or page. Normally I do not do these posts weekly, however this past week I happened to go on a couple jaunts that ended with a few piles of books that I wanted to share. 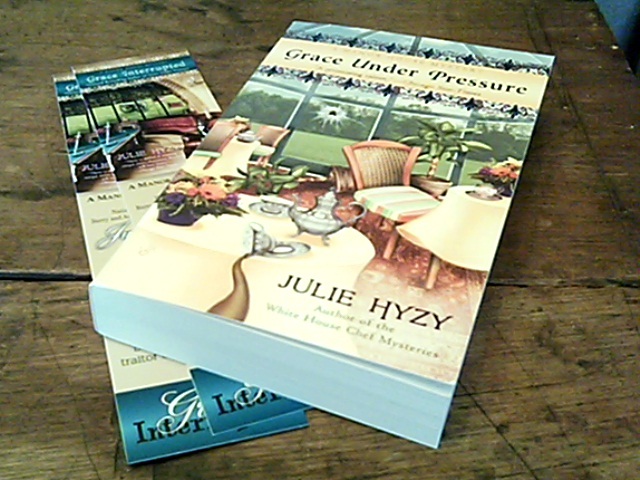 A friend sent me a link to Julie Hyzy's blog where she was promoting her next book in the Manor House Mystery series, Grace, Interrupted. Offering a book for a review, and being a BIG fan of her White House Chef Mysteries, I threw my email into the giveaway pot. While I did not end up getting a copy of that book, Julie was gracious enough to offer her first in the same series, Grace Under Pressure, along with a couple bookmarks. Did I mention she autographed the book too? So, as I mentioned I happen to be on a used bookstore kick. Now that I have started collecting series that I want to own and keep, while the pretty shiny new books are wonderful, there is something about browsing used books and finding those little gems. Sometimes it happens to be a cover design you really like, or that middle book that somehow went out of print and lo and behold, there it is! My travels this past week took me not only to Red Fox Books in NY (as noted from my earlier post) but this day to Grey Matter Books and Troubador Books in Hadley, plus Cherry Picked Books in Easthampton. Originally scoured because Cherry Picked was supposedly going out of business, the owner informed us that he was in fact staying open. Yay for that! The Woman Who Rides Like a Man by Tamora Pierce. 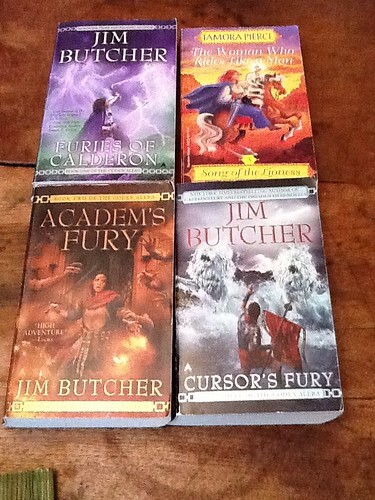 Furies of Calderon, Academ's Fury and Cursor's Fury by Jim Butcher. Blood Orange Brewing and Dragonwell Dead by Laura Childs. 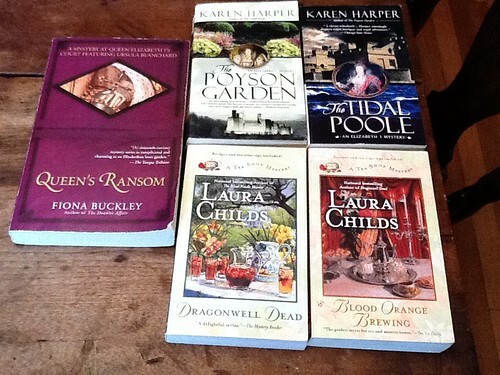 The Poyson Garden and The Tidal Poole by Karen Harper. Queen's Ransom by Fiona Buckley. 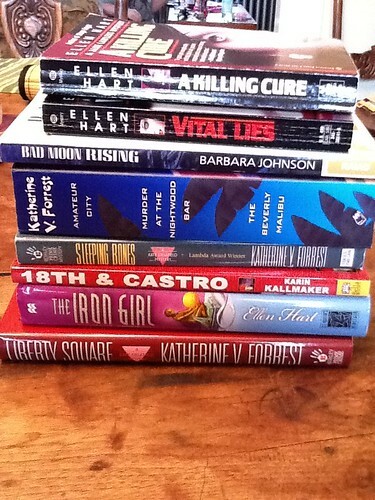 Vital Lies, A Killing Cure and The Iron Girl by Ellen Hart. Liberty Square, Sleeping Bones, Amateur City, Murder at the Nightwood Bar and The Beverly Malibu (in an omnibus) by Katherine V. Forrest. Bad Moon Rising by Barbara Johnson. 18th & Castro by Karin Kallmaker. 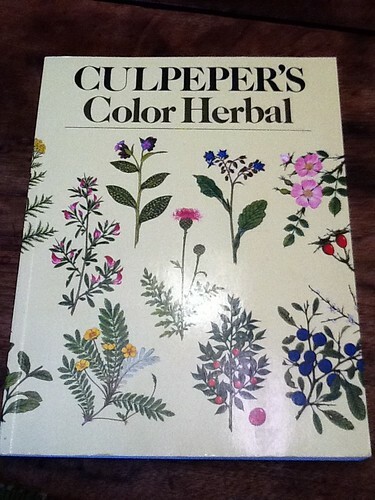 Culpepper's Color Herbal edited by David Potterson. Well, I guess this is not really a pile, as I couldn't find any gardening or cooking that I truly wanted (this time). I remember this book from my days working at Waldenbooks. It was always on the shelf. I am well on my way to getting complete collections of many of the series titles I was able to acquire. However, I admit to having started some new ones too. You've got some great books there!